As I’ve put this tag line out there, I have found that lot of people think it’s a marketing tool, a way of saying that you should hire me, because there is an instruction manual, and, as a professional I have it, and I can give it to you. It’s a reasonable misunderstanding, I suppose. But those “lot of people” would be wrong. That’s not what the tagline means at all. Our children tell us what they need and how to care for them. The question is: are we listening? Do we know how? How would we have learned? That’s where it gets tricky. Many of us don’t know how. Or, more accurately, we do know how, but we don’t trust ourselves. So now we’re already “in the red” just by virtue of the fact that she’s already crying! We feel that we must respond immediately (if not before), whether we’re psychotic from sleep deprivation or not. But what if she’s actually in pain? Okay, I’m trying to understand what she is saying, I’m really trying, I can’t figure out what she’s saying! Where is that line? How do I know where that line is? What does “too intense” or “too upset” look like? How do I know? Okay, but how do I know when she is frustrated, or hungry, or testing? And she’s so tiny, what’s the matter with me helping her? I can’t just sit there and watch her reach in frustration for something for twenty minutes and not help her–that’s my job! Oh, how we hear those voices. And they paralyze us. It reminds me of one of those stop action films in which a person makes a move and then the film goes in reverse and then they do it again and again. Back and forth, always essentially in the same place–and all because we don’t trust ourselves. And get this. While we’re going back and forth, not trusting ourselves, the experts are telling us that our children can feel that we don’t trust ourselves, and when we don’t trust ourselves, it gives our children a feeling of insecurity, and when children feel insecure, it shows up in more emotional outbursts or difficult behavior. I see. So pretty much the only option for parents is to be perfect. How’s that workin’ out for you? Not so good? Yeah. Me neither. I would argue there is an alternative to being perfect (whew). No, it’s not observation (and reflecting your observations), though that is really important. No, it’s not responsiveness, though, without a doubt, responsiveness is a critical piece of the puzzle. The alternative is (drum roll)….Authenticity. With a side order of independent critical thought, a hearty helping of self-awareness, and a cup of accountability. Enhanced Authenticity, let’s call it. This is the hardest truth, in my opinion. You cannot parent according to someone else’s instructions, even if that person is your guru, your mentor, your god, or your role model. You can only parent as you. And when you try to parent as someone else–the person you admire, the book you read, the script you’ve been given–it often doesn’t work the way they said it would. Because it’s not you. It’s them. That’s why it’s important to learn to read the instruction manual that is in your child’s possession. Because it’s perfectly personalized, a unique set of instructions for a unique person. That’s where the self-awareness and independent critical thought and flexibility and observation and responsiveness come in. The goal is not to do it like the person in the book or on the computer screen. The goal is to be informed or inspired by the person in the book or on the computer screen and then to do it like YOU, in response to what your child is telling you that they need. And while we’re at it, I don’t know if kids take in every bit of our uncertainty or stress (well, yeah, I kinda do, but that’s a different conversation), but I know for sure that they are fully aware, even as tiny infants, whether we are authentic or not, whether we are fully present, whether we are being ourselves. You can see it in their eyes…or if you’re particularly lucky, and you keep using other people’s words and tone as your child gets older, you might even get to hear it roll sarcastically out of their mouth…”oh, did they tell you to say that in that book?” That’s when you know you’re “sunk” (as my dad would say.) They’ve got your number. They know it’s not you. And then you have to start over, and you feel discouraged. We don’t want that. 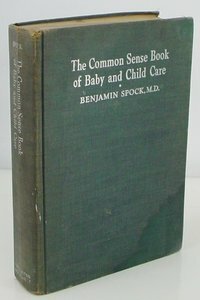 Yo u know, it was 1946–almost 70 years ago–that a pediatrician named Benjamin Spock published a book called The Common Sense Book of Baby and Child Care. It remains the best-selling parenting book of all time, and is still being sold, now in its 9th edition. It’s message to parents? “You know more than you think you do.” The original wasn’t a perfect book, none of them are. I’m sure we’d all find things to disagree with. It was a different time, things are known now that weren’t known then, his philosophy may not resonate. But that message? That’s the ticket. You do know more than you think you do. You know your baby. You know yourself. If she’s crying and it seems like too much to you and think you should offer to pick her up and she clearly communicates that that’s what she wants and needs at the moment, pick her up! If she’s crying and it seems like it’s not really quite a cry, but it’s her way of expressing frustration but you wonder if she really might be able to figure this out herself, and you can keep yourself from picking her up, but stay near so you can observe and see what happens, do that. If she’s squirming and uncomfortable in the carrier on your body–even though the books and your friends tell you that that’s the best place for her–she is telling you that she knows best what the best place for her is. Listen to her, and put her down. Try it out. Try just observing and listening. Stepping back a bit. See what happens. See what you can learn. Use what you learned next time. Try the words in the book. Does it sound like you? Does it feel like you? Yes? Great. No? It’s no great crime. Learn from it and try a different set of words next time, even if the words are not the ones that the book suggested. Now does it work? Does it sound like you? Great. On another day or in another four months or in another two years, those words and that strategy might not work anymore. No big deal. Say to yourself “Huh. I guess that’s not quite the right thing anymore” and come up with new wording. See how it feels. See how it’s received. Does it sound like you? Does it work? Great. If not, you’ve learned something. Try again. And again. Find your own voice. You know more than you think you do. Again and again, I read comments from parents who say “I tried sportscasting, but it didn’t work. What am I doing wrong?” If you tried sportscasting and it didn’t work, then sportscasting probably isn’t the right tool anymore. Trust yourself. That’s what we’ve lost in our sea of parenting literature and philosophies. Inspiration is good. Dogma, not so good. So back to those instruction manuals for a minute. In my work, parents frequently want me to tell them what to say. In detail. In specific. 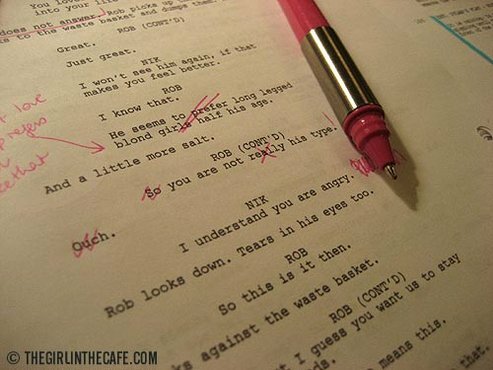 A script. A few people have joked that they wish they could have an earpiece in their ear that I would speak into and tell them what to say. Which is precisely what led to this post on this particular day. I’ve watched this video (and many other examples) over and over again, and I’m still trying to figure out where the “Nurturing” part is in this method (I see plenty of the “No Nonsense” part)…but the thing that strikes me most strongly is the inauthenticity. There is no love, no caring, no affection, no passion, no life, no love of learning or teaching, no enthusiasm, no excitement for school and learning new things in this teacher’s voice and delivery. She is saying someone else’s words. She is using someone else’s manual. She is following directions. Even the children notice. If you ever want a handy measurement for whether something is authentic or inauthentic, ask yourself if you would speak this way to your spouse or to your best friend. When a child is crying, and you respond, are you saying and feeling what you would say and feel if your sister showed up at your door in tears? If you are communicating to a child that you would like them to stop a particular behavior, is your tone similar to what it would be if you wanted a spouse–or even a hired professional–to stop doing something that bothered you? Children are people–no more, no less–and we can check our authenticity by looking at whether we are, in fact, speaking to them as people. Now, I understand that the defense of these methods is that they are designed for teachers that feel out of control in their classrooms, often young teachers–and seemingly even more frequently, young white teachers working with children of color (which is a whole ‘nother ball of wax that will have to be for a different blog post, just way too much to say about that.) They are designed for teachers who “don’t know what to do” with children whose behavior feels unmanageable and who want their students to be “successful” and to “learn”, missing the fact that skills and facts are not the only thing–or even the most important thing–that children learn in school. Yes. These methods are for teachers who feel out of control (and who are evaluated by whether their students meet Common Core benchmarks.) I get that. But that’s really not so far from the daily experience of many parents and caregivers–we often feel similarly out of control. So when parents say to me “That’s what I need. Exactly what to say. A list of instruction. Steps to follow. A cheat sheet.”, I will admit…I don’t quite know what to do. I want to help. And yet I know what I know. A person or a book can tell you what to say. But it might not work, because it will be them talking, not you. And it has to sound like you. A friend of mine, who has a toddler, said to me recently “I don’t know what I’m doing.” Right. None of us know what we’re doing. Because it changes all the time. And because every child is an individual. Does it feel like the right thing? Are you getting the results that you’re after? Do you feel like you’re building in your child the skills and values that will serve them well in the long run, when they’re out of your sight? Then you do know what you’re doing. A person can help you to learn to “read” your child’s instruction manual, but the person won’t be there when the page turns–when a developmental shift occurs (which it does nearly every week during infancy), when a life change takes place (a move, a sibling, a new school), when they tire of a method or simply stop responding for whatever reason. And then it is up to you–to tweak, to adjust, to come up with something new, using the same principles, remembering that the more that you practice, the more you will make it yours– and the more that you make it yours, the more effective it will be. Authenticity. When the page turns, the same words may not work. The same tone may not work. While the neutral narration or sportscasting was once extraordinarily effective, now your child finds it annoying or condescending. While you could once physically remove a child from a dangerous situation, now they are stronger than you. While a hug and a cuddle and a kiss on a boo-boo was once the poultice that fixed all, now you get a grunt as they turn away, or a resounding “Humph!” That will be a new page in the manual. It will require new words, new strategies, new inflection in your voice, new levels of empathy. When that happens, you may once again find yourself saying “Boy, I wish there was a manual for this”, because you’re not sure what comes next, what needs to change. And once again, you can turn to your child. They will tell you–with their words and with their behavior–what works and what does not work. If it is anything, parenting is a process of continuous analysis, adaptation, and fine-tuning. The hardest truth is that books and experts and friends and family can give you hints and guidelines. They can help you to learn to “read” your child’s communications and signals. And then it’s up to you. Nurture your confidence in yourself. Choose words that sound like something you would say. and say them in a tone that matches your intention. If you feel sympathetic toward your child’s frustration, sound sympathetic. If you feel frustrated, it’s okay to sound frustrated (it is possible to sound frustrated without shouting or anger.) If you’re joining your child in her wonder or confusion, sound like you are wondering. Authentically wondering. Do you know what wonder sounds and looks like? Do that. Ask your child–whether in words or by simply observing their behavior– to tell you what she needs. Today. Try it today. The beautiful thing about children (and sometimes one of the most challenging things about children) is that they cannot be anything other than authentic. Make that awareness your challenge–to be as authentic in your words, intonation, and emotion as your child. He has the instructions. Believe him. This entry was posted in children, communication, discipline, listening, mindful parenting, parenting, understanding children, what to say and tagged "as a matter of fact, adaptability, behavior, children, communication, directions, flexibility, how to understand children, instructions, knowing what your children need, manual, parenting, scripts, they do come with instructions", thinking on your feet, what to say. Bookmark the permalink.